Traditional calibration sources for radiometric calibration, such as Deuterium, Quartz Tungsten Halogen, and Xenon-arc, all have limitations in spectral range. No one source covers the full UV-Visible range from 200nm-800nm with output at comparable levels across that spectrum. In addition, traditional sources require recalibration after 100 hours or less of use and lamp replacement typically after 500 hours. With its revolutionary Laser-Driven Light Source™ (LDLS), Energetiq offers a calibration solution that addresses these limitations and provides a single, broadband, high brightness source for radiometric calibration. The EQ-99CAL combines radiometric performance with long life, longer recalibration intervals, and low cost of ownership. Calibrations made in the 350nm range are particularly challenging with Deuterium and Quartz Tungsten Halogen lamps. In the case of Deuterium lamps at 350nm, the irradiance is approximately an order of magnitude lower than its value in the deep UV at 200nm. Similarly, Quartz Tungsten Halogen lamps at 350nm are more than an order of magnitude lower in irradiance compared to their value in the visible range. Additionally, it is frequently problematic to have the two separately calibrated lamps agree at the overlapping wavelengths, adding additional uncertainty. 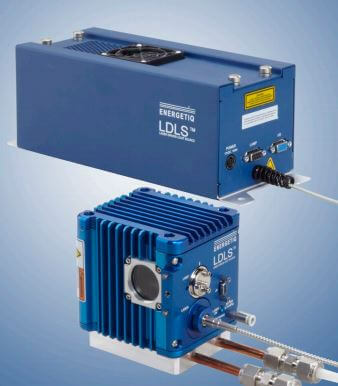 With the LDLS, a single calibrated light source covers the whole range from 200nm to 800nm, and at 350nm exhibits an irradiance an order of magnitude higher than traditional calibrated Deuterium and Quartz Tungsten Halogen lamps. Energetiq’s EQ-99CAL product is calibrated at our calibration partner, Bentham Instruments, Ltd. Bentham’s calibration standards are traceable to the National Physical Laboratory (UK). A certificate of calibration, which comprises the calibration data and the uncertainty analysis, is included with each EQ-99CAL. Sample calibration reports are available upon request.